Sometime last spring, I made my first attempt at hand carving rocks. There was an area around the spur to Dry Creek Coal #2 at Summit Springs where I wanted a rock face, in part because of how steep the hillside is here. I also wanted to experiment here before attempting to carve the rocks around the tunnel portal at the entrance to Brocks Gap Tunnel. This is a large area, and I'd like it to be a signature scene on the layout. Therefore, practicing a little before attempting this project seemed to make sense, especially since I've never done this before. I've collected numerous photos of rock outcroppings and rock faces over the years, so I had a good idea of what I wanted. I had also accumulated all of the materials that Joe Fugate recommends in his Ten Mile Creek video series for hand carving rocks (see this link for the videos: http://model-trains-video.com/index.php). So after reviewing the video one last time, I was ready to go. The picture below shows the end results. This is one of only two shots I have of this area, largely because I was never happy with the way it turned out. The color was wrong, the texture was wrong, and the shape was wrong. Other than that, it turned out great! I used too much Portland cement in the plaster mix which resulted in the texture being too coarse. I used some craft paints to weather the rock surfaces. The paints were fine- I just used some of the wrong colors. I got more of a tan/brown appearance rather than the grey/white I was after. And most importantly, I didn't use those photographs I mentioned previously when carving the plaster. The resulting rocks looked it- too much of the same shape and not enough variations. Finally, the overall square shape of the entire rock face just looked wrong. So I knew I would have to redo this at some point. Well. that some point occurred over the last several weeks. In addition to re-working the original rock face, I carved the rocks around the entrance to Brocks Gap Tunnel. The picture below shows the new rock face. Some new plaster was added to the left hand side of the old rocks in order to get a more natural look to the overall face. The existing rocks were re-shaped by chipping away at the old plaster. During this process, most of the original surface was removed. This left the light grey of the original plaster along with the darker grey that was used as the base coat. This was exactly the color combination that I had been after originally. So armed with a little success in re-shaping the rock face, I set about to carve the rocks around the portal to Brocks Gap Tunnel. The picture below shows the end results. This time, I used several photos when carving the rocks. 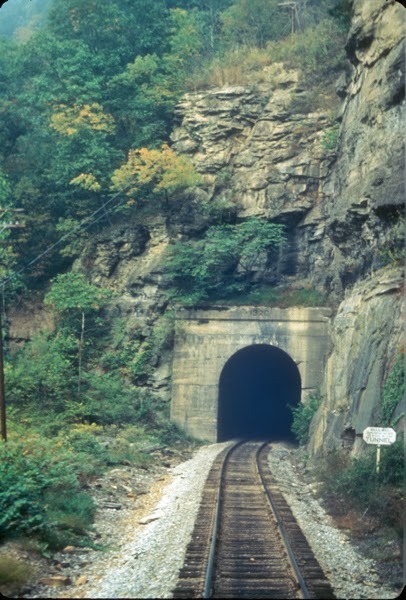 The shot below of a tunnel portal somewhere on the Clinchfield shows what I was trying to capture. I'd give credit for this photo where due, but I found it somewhere on the Internet. A lot of the shape of the rocks along the right hand side was the result of the original application of plaster. Nothing like a little luck to help a project along! The rest of the shapes were carved over a week period. I'd carve a little, step back and look, and carve some more. Then I left the project for a period of time. When I came back, I'd find little things that I wanted to change. By the end of the week, the final shape was in place. Here's a couple of close-ups. The plaster was painted with a medium grey craft paint as the base coat followed by a wash of brownish black craft paint. Once this dried thoroughly, I went back and added highlights with several lighter shades of grey craft paint. A light application of some weathering powders completed the process. With the exception of ground throws for the turnouts, all of the scenery in this area is now complete. Here's the view looking from Laurel Ridge Coal toward the west end of Summit Springs. And last up, a short video of DE 9 headed westbound. Railroads and railroaders have a tendency to name everything, and with good reason. It's important to be able to report exactly where a train is at anytime, and named references that are understood by everyone allow this to happen quickly and efficiently. It's also helpful in providing instructions to crews such as which track in the yard to spot a cut of cars or the location where two trains are to meet. When I first drew up my track plan many years ago, I named the various streams in addition to all of the towns and stations. I recently found one of the stream names laying on the HN Cabin panel at North Pierce where it had been placed when I removed it to re-do the scenery in this area. It is a piece of .060 styrene that had been painted the same green color as the fascia and then lettered using Letraset dry transfers. A quick coat of flat finish sealed the lettering. This is the same lettering method that I used for all of the panels on the layout. It's time consuming to say the least, and dry transfer lettering is becoming difficult to find. As I was getting ready to remount the stream sign, it occurred to me that I could print these up in Word by matching the font and the background color as closely as possible to the few signs that were already finished. Once printed, I could get them laminated at Staples, cut them out, and glue them to the fascia. It would take a fraction of the time that the previous signs took to complete and would hopefully look just as good. So here are the results. First up is the sign for the tunnel at Logan, WV and the Logan town sign. The stream at Big Chimney and the tunnel to the east needed names, so signs were made for these as well. Signs were also needed for Big Chimney along with the creek under the trestle leading to the Sand Fork Branch. Of course, now that all of these are finished and attached to the fascia, I'm beginning to wonder if a different background color might look better. Perhaps a black background with a thin white border around the lettering would look better and help distinguish the place names from the panels. Thankfully, making those changes only requires few minutes on the computer and a trip to Staples. When I first decided on modeling an Appalachian coal hauler, I knew I was going to need a lot of hopper cars. It didn't seem like a big deal at the time, and certainly not something that would deter me in any way. So I started building a few here and there, along with other rolling stock projects. The first two were Athearn 55-ton ribbed side cars that were lettered without any real thought as to how the car numbers would fit into the overall scheme of the railroad's numbering series. As I got more serious about developing the history of the Chesapeake, Wheeling & Erie, and after reading Allen McClelland's book The V&O Story, I developed a numbering series for the locomotives and rolling stock. About the time I developed the numbering series, McKean announced their 12 panel 100-ton hopper car kit. I knew this was going to be the standard hopper car for the railroad, so I began painting and lettering them for the home road. I was using Champ Block Gothic decals for the large CWE herald, Champ Railroad Roman for the Central Belt logo, and Letraset dry transfers for the numbers and end lettering. Needless to say, lettering each car with individual decals and dry transfers was incredibly tedious and time consuming. Once Champ modified the style of their Railroad Roman decals in the mid-1990's, I finally bit the bullet and got custom decals from Ron Roberts at Rail Graphics. This really helped speed up hopper car production, and I finally began to make some progress in developing the fleet. Feeling pretty good about the number of cars I had built, I figured out how many coal cars would be needed for the layout. Including the five branch lines and the on-line mines, the number is 140-150 cars (loads and empties). This is in addition to trains of loads and empties that would traverse the layout from one staging yard to another. A quick tally of how many cars were already built, and... sigh... it was going to be a long time until I had that many cars ready for operation. The layout wasn't anywhere near being ready to operate at this point, so I decided to keep plodding along and not worry about how many cars would eventually be needed one day. For the next ten years or so, I tried to keep at least 2 hopper cars in some state of production at all times. Sometimes this worked better than others. At various time I had 3 cars in production. I also started keeping a running tally of both loads and empties that had been completed and noted the date when the latest additions were made to the fleet. Checking the dates periodically revealed that it would be at least another 40-50 years before before I had enough cars to properly operate the railroad, at least at the rate I was going. Fast forward to 2012. The layout is finally being operated on a fairly regular basis and I'm lucky enough to have just about enough cars to pull this off. We're still not working the Dry Creek loader at Summit Springs and the Elkwater Branch Roustabout and Dry Creek Turn, both of which come on the layout from staging, have a limited number of coal cars. We're pulling loads and empties at Allison Coal Company in North Pierce. But the Purgittsville Turn (another train from staging) isn't even in service yet and we're using N&W cars for the mine at Nelsonville. It's clear that the pace of hopper car construction needs to pick up, and pick up quickly, if we're ever going to have enough cars to fully operate the layout as it was originally intended. Each week I'll complete the five steps above for two cars. The photo below shows the box that contains the eight cars in the first 4 stages. The two cars on the right need to have the interiors painted with Sophisticated Finishes iron paint prior to weathering. Applying the rust solution to the iron paint will be part of the weathering step. And the two cars that are ready to be weathered are in another box. As the above photo shows, the system seems to be working- at least so far. Granted, we're only into the second week. But it's been surprising how little effort is required to complete each step. And I have a whole week to do it. So stay tuned- this little plan just might work. ... a long, long time. The first two, actually. I just finished two Details West 50' double plug door boxcars lettered for the home road and it occurred to me that I hadn't done a CWE boxcar in a long time. In fact, I believe the last one I did was a 60' auto parts car that I finished while we still lived in Dayton, Ohio. And we moved from Dayton to Cincinnati in 1992. Once I started on the layout here in Cincinnati, there were too many other priorities. But now that the layout is operating, I finally got around to building these cars. The first step with these kits was to remove the top of the coupler box from the bottom of the car. For whatever reason, Details West cast this onto the end of the bottom which would make it impossible to replace the coupler once the frame, which includes the coupler box, was glued to the bottom piece. I held the top of the coupler box in place over the coupler box and tapped it for a 2-56 screw. I then added Kadee #5's and screwed the top to the coupler box. I also tapped the truck bolsters for 2-56 screws. Added details include A-Line stirrup steps, Details West etched brass cut levers, and Kadee metal wheel sets. I also added some additional weight to each car. The cars were painted Floquil Pullman Green which is the same color as the diesels on the CWE. The underbody of the car and the trucks were painted with Rust-Oleums' camouflage brown which is plastic compatible and dries completely flat. Once the cars were painted, I weathered them with washes of artist's tube acrylics thinned with Windex. These cars went into service in 1971, so I gave them a moderate amount of weathering. After staring at some of the beautiful covered hopper cars that Tom Johnson posted on the MRH forum (http://model-railroad-hobbyist.com/node/14896), I thought I would try my hand at a few of them. And once he posted a tutorial on his weathering techniques, the die was cast- I had to give it a try. The two TGCX cars were weathered using water soluble oil paints and Micro Scale's Microsol as a thinner. I picked up this technique from Rich Divisio on the old Model Trains Weathered website, which is no longer available. The technique involves thinning some of the oil paint on a pallet, applying it to the model, and then removing it with gentle dabs of a brush that's clean. It's a great technique for adding the typical accumulations of dirt and crude that build up on the ends, bottoms, and tops of cars, but I didn't have much success initially in getting the streaks on the sides that I was after. The paint wouldn't come off as it had previously- perhaps I let it dry too much or put too much on. In any event, I went back over the sides using a brush that had been dipped in 70% isopropyl alcohol and then wiped almost dry on a paper towel. The streak effect worked OK, but I didn't get the fine lines that Tom J. has been able to capture on his cars. Next up is a covered hopper that I weathered for John Miller after he painted the car and added the decals. The first step was to spray the sides and ribs using a custom dirty brown mix of Floquil paint. I then wiped the ribs with a Q-Tip soaked in Turpenoid to remove the spray. Next, I used Windsor & Newton oil paints thinned with odorless Turpenoid to add the streaks to the sides. Tom J. 's tutorial was instrumental in helping me learn the techniques for the streaks. I use a small block of wood held parallel to the ribs to guide the brush as I pull it down the sides. This helps insure that the streaks are straight. The trucks were painted with Rust-Oleum's camouflage brown and then given a light coating of weathering powder. The bottom and ends were weathered using the techniques outlines in Tom J. 's tutorial. For the CWE covered hopper, I used the same techniques that I used on the K&LE car. The primary color used for the streaks was Van Dyke Brown. As these cars haven't been in service all that long, I kept the rust marks and steaks to a minimum. This is my first foray into oil paints in many, many years, and the first time I have used them for weathering the entire surface of a car. While I need a lot of practice, I'm reasonably pleased with the way these cars turned out. It's been fun to explore some new mediums and to see the effects that can be created. [GEORGETOWN, KY- FOR IMMEDIATE RELEASE- September 15, 1976] Thayer Consolidated Industries (NASDAQ- TCII) announced today the signing of a major new transportation agreement with the Chesapeake, Wheeling & Erie Railroad and the Kanawha & Lake Erie Railroad. The agreement provides for the railroads to expedite shipments of grain for TCI's Thayer Grain Company subsidiary from locations in the Midwest to the east coast port of Hunters Bay, VA.
Yvonne Thayer, President and CEO of TCI, said "We are very excited about this new agreement and are confident that it will allow us to significantly improve our service to all of our customers. Our goal is to shorten our delivery times in order to meet the growing demand for overseas grain shipments as a result of the bilateral grain sale agreement recently entered into by the United States and the Soviet Union." Thayer Grain Company will route its eastbound grain shipments from the Midwest to the K&LE at Cincinnati, OH. From there, the grain will travel east under the run through agreement between the two railroads that was recently announced. Stuart Thayer, Vice President of Transportation for TCI, said "This new agreement is part of TCI's ongoing efforts to improve all areas of our operation, but most importantly, it will speed up delivery of all of our grain products to our customers. We are extremely pleased to have entered into this arrangement with the CWE and K&LE and look forward to working with them in the future." TCI is headquartered in Georgetown, KY and has investments in a wide variety of natural resources. In addition to Thayer Grain Company, other subsidiaries include Thayer Sand & Gravel and Thayer Pulpwood. It may be hard to believe, but after spending over thirty years in the hobby, I've never made a load for a regular service flat car or gondola. I've added a few trailers to some piggy-back flats, constructed a crane tender flat with various tools and small pieces of equipment, and made more than my share of coals loads. But nothing for a flat or gon- until now. 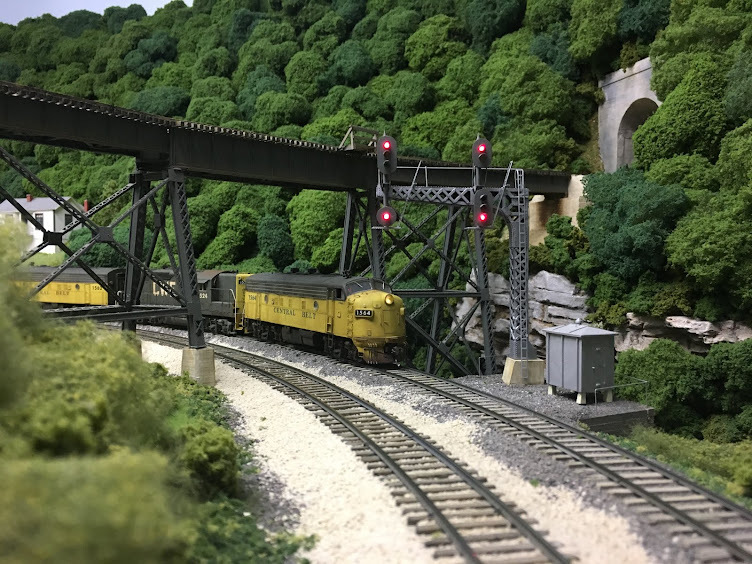 At a recent meeting of NMRA's Division 7 here in Cincinnati, well known author and modeler Matt Snell made a presentation on constructing MOW equipment and including it in operations. His presentation gave me the idea of routing a gondola full of ties to the team track at Big Chimney, WV. Sometime later, I saw a CR gondola that Gary Christensen did over on The Rustbucket forum. Here's a link: http://tws-rustbucket.com/thread/5281/conrail-587094-thrall-gondola-load?page=1. You need to join the forum, but membership is free and the site is full of incredible work and absolutely beautiful modeling. Gary's gondola is incredible in and of itself, but what really caught my eye was the tie load. The colors were perfect, and he had really captured the look of recently creosoted wood. In response to a question on the forum, he explained how he did it. That was all I needed to get started on my project. Following Gary's lead, I cut several pieces of balsa wood to fit into the bottom of one of my gondolas. If I had paid a little more attention, I would have made the base for the load a little thinner so that I could have added a more random layer of ties at the top. I used a spray bomb to paint the base flat black. After that, I cut a bunch of kitchen matches to size and painted them with a mix of black and white craft paint. Once all the ties were painted, I added some more white to the mix and went back over some of the ties to get some variation in color. When the paint dried, I glued them to the base. The photos above show the gondola spotted on the team track at Big Chimney, WV awaiting the MOW crew. This was a quick and easy project, and I'm anxious to get started on some more loads for some of the other flat cars and gondolas in the fleet. Last month, I finished up a couple of GP38's for the railroad. As I wrapped up the project, it occurred to me that this was the first time in over 25 years that I had worked on a GP38. The new units are intend to supplement/replace the older ones, so's here's a little history on the victor and the vanquished. I bought two Atlas GP38's at a train show in Cleveland in 1984 along with a Life Like GP38-2 and two Athearn GP9's. I had always intended to have a fleet of GP38's and GP38-2's for the railroad, and this seemed like to the perfect time to start. The Atlas units had the correct width hood, and with some detail modifications, they would make great additions to the budding fleet. I finished the first one in 1984 and the second one in 1987 (I think). I removed all of the detail from pilots and added parts from Details West and Details Associates, carved off all of the grab irons and replaced them with wire grabs, re-built the brake wheel location and step, and replaced the plastic handrails and stanchions with brass wire and Athearn metal stanchions. The photos below show the old unit next to one of the new Atlas units. Over the years I added different decoders to the older Atlas units. They never ran very well and were extremely noisy. I'm sure they could have been tuned to run a little better, but once newer products came out with better motors and detail, I decided to relegate these units to dummies. Therefore, the motors and gears were removed. The photo below shows 2001 in service with two of the most recent units purchased by the railroad, U30B 3553 and 3558. Unfortunately, 2015 will have to be relegated to the display case. When I modified the frame to accommodate the new brake wheel housing, it was bent in such a way that I can't mount a coupler on the front of the locomotive at the correct height. And at some point in the future- once some additional units are on the roster- the 2001 will join it as the incorrect fuel tank has always bothered me. The photo below shows a close-up of 2016. The unit was weathered using washes of tube artist's acrylics thinned with Microscale's Micro Sol. Some weathering powders were also added. A neat trick that I picked up from Rodney on the Rust Bucket forum is to use a pencil to simulate the worn tread on the walkways. Rubbing the side of a pencil along the grating really simulates the bare metal edges where the paint has been worn off. The photos below show 2016 and 2013 at SJ Cabin at the east end of Hollister Yard. As you can see from the shot above, both of these units came decorated for Seaboard System- the stripes are visible on the noses. I thought the factory paint was thin enough that it wouldn't show. Note to self- strip the units next time. There's also a detail missing from the pilots. It's a bit surprising given the level of detail on these models. If you look at the photos of the old Atlas unit you'll find it pretty quickly. I may go back and add it later along with some sanding lines on the trucks. I rushed a bit to get these units completed for the last operating session, and little things like this occur every time I rush a project. The photo below shows 2016 in its regular assignment, paired up with SD35 2505 as power for the Elkwater Branch Roustabout. Both of the GP38's have Soundtraxx Tsunami decoders, high base speakers and LED's installed. The SD35 was the regular power on the Elkwater Branch previously, and it didn't have sound. With the addition of 2016 to the consist, all of the trains on the layout now have sound units in the consists. I'm still working on the pair of F7's that will take over the Sand Fork Shifter at some point. Now that the most recent operating session is complete, I have time to work on some other projects such as these units. But I'm not going to get caught up again in rushing to get something completed for a session. It's a lot more fun to work on whatever you feel like versus what you think should be completed for the next session.